With events slated to take place in Durham, NC; Minneapolis, MN; Louisville, KY; and Indianapolis, IN, ArtPrize will offer four $5,000 grants to artists pitching ambitious public art projects for the eighth iteration of the international art competition. GRAND RAPIDS, Michigan, March 29, 2016 -- ArtPrize, the radically open international art competition decided equally by public vote and expert jury -- together with partners 21c Museum Hotels and Delta Air Lines -- today announced plans for expanded Pitch Night programming slated to grant $20,000 directly to artists with a vision to bring challenging public art projects to ArtPrize. Events will take place once again in Minneapolis, Indianapolis, and Durham, with the addition of Louisville in 2016 -- granting four artists $5,000 and the chance to exhibit their work in a high profile downtown venue during ArtPrize this fall. Submissions are now open for all four Pitch Night events. Five artists will be invited to present at each of four Pitch Night events -- and given five minutes to sell their installation idea for ArtPrize 2016 to a panel of five local art experts. The winner of each event will receive a $5,000 grant and a guaranteed spot on a highly trafficked ArtPrize Venue in downtown Grand Rapids this fall. The 2016 ArtPrize Pitch Night program will include events held at two 21c Museum Hotels locations, in Durham on May 25 and in Louisville on June 1; the Walker Art Center in Minneapolis on May 26; and the Indianapolis Museum of Art in Indianapolis on June 30. 21c Museum Hotels will host the first Pitch Night event of 2016 in the heart of downtown Durham in the historic Hill Building, which 21c converted into a 125-room boutique hotel, contemporary art museum and cultural civic center. 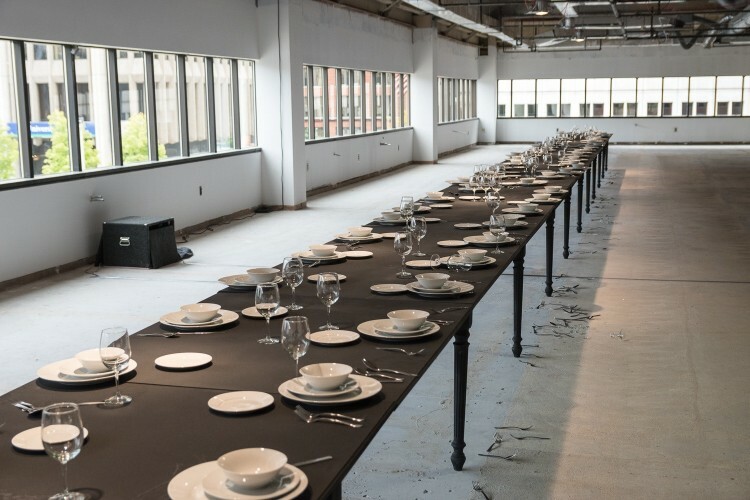 On May 25, artists will pitch their ideas for an ambitious public art project to take residence on the seventh floor of an empty office building located at 200 Ottawa during ArtPrize this fall. 21c Museum Hotels will hold an information session for interested artists at their Durham location on April 14. Submit proposals for Pitch Night Durham by May 5 to pitchnight@artprize.org, and find more information here on how to apply. The Walker Art Center held the first Pitch Night event in 2013, and will soon host its fourth annual event in partnership with ArtPrize. The winner of the May 26 event will share the seventh floor space at 200 Ottawa with the Pitch Night Durham winner. Applications must be submitted to www.mnartists.org/pitchnight2016. Find more information on how to apply for Pitch Night Minneapolis here. Proposals will be accepted through May 5. New for 2016, 21c Museum Hotels will host a Pitch Night event at their Louisville location. The winning artist from this event will realize their public art project on Lyon Square, which hosted Resting Place by Heather Gordon, winner of Pitch Night Durham in 2015. 21c held an information session for this event on March 10. Contact pitchnight@artprize.org with questions or to submit a proposal by May 5 for the June 1 Pitch Night Louisville event. Find more information here on how to apply. In 2015, ArtPrize visitors awarded the Public Vote Installation Category Award to Whisper by Emily Kennerk, winner of last year’s Pitch Night event held at the Indianapolis Museum of Art (IMA). The IMA will hold its second annual Pitch Night event on June 30 at 7:00 p.m. in the Toby Theatre, and is accepting installation ideas for the atrium of the Ledyard Building, located at 125 Ottawa. Interested artists will have the opportunity to attend an information session at the IMA’s Deboest Lecture Hall on April 14 at 6:00 p.m. EST. Submit proposals for Pitch Night Indianapolis by May 5 to pitchnight@artprize.org. Find more information here on how to apply. ArtPrize will return to downtown Grand Rapids, Michigan from September 21 to October 9, 2016. Venue registration for the eighth annual event is open through April 7, and artist registration from April 18-June 2. Photo: 'Whisper' by Emily Kennerk, winner of Pitch Night Indianapolis in 2015 and of the ArtPrize 2015 Public Vote Installation Category Award.